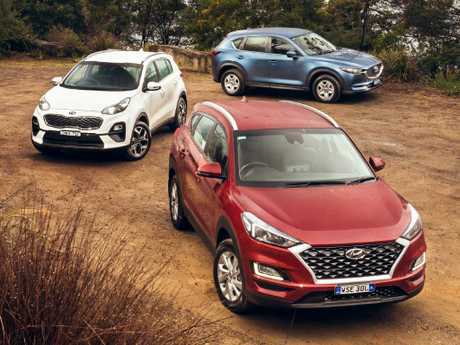 The recently updated versions of the Hyundai Tucson, Kia Sportage and Mazda CX-5, from left to right. Picture: Thomas Wielecki. IT'S easy to be overwhelmed by the choice of mid-size SUVs. More than two dozen models cram the market. However, it's a good time to consider this trio - each is among the best in class and has just had a freshen-up in the past few months. We've selected models in the affordable end of the category: between $31,990 and $33,790 drive-away. 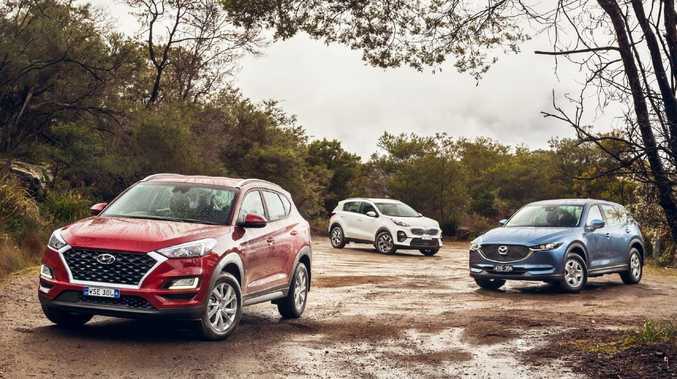 The Hyundai Tucson, Kia Sportage and Mazda CX-5 are three of the top four sellers in the class. The Toyota RAV4 isn’t in this test as a new model is due in early 2019. Picture: Thomas Wielecki. At $33,790 drive-away the Maxx is the dearest in this test even though it's the base model. You can buy the next model up in the Kia and Hyundai ranges for slightly less money. The Mazda comes with the most standard safety tech, including blind-zone warning, rear cross-traffic alert, and, unique among this trio, front and rear autonomous emergency braking. As with the others it comes with AM/FM and digital radio but built-in navigation is optional. Mazda is adding a smartphone mirroring accessory later this year. Recent updates to the Mazda CX-5 make it nicer to drive. Picture: Thomas Wielecki. 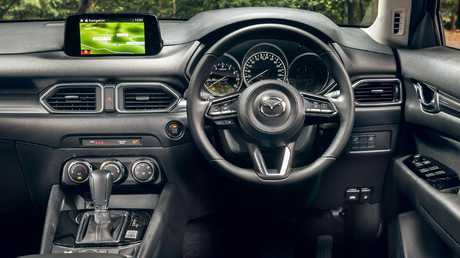 The rear camera display is comparatively small due to the Mazda's seven-inch screen but it's a wider angle lens than the others and provides a clear view. There's no digital speedometer and the instruments are beginning to look dated but they're easy to read. There are two USB charging ports and two 12V sockets in the front and one 12V in the cargo area, but no power to the back seats - you need a long cord from the front. Luxury touches include push-button start, leather steering wheel and gear selector and electric park brake. However there's no light for the vanity mirrors and only single-zone airconditioning versus dual-zone in the other. The cabin has a better quality feel than the others and the attention to detail extends to fabric and soft-touch materials in the door panels. The Mazda CX-5 interior has good quality materials but the design is looking a little dated. There’s no digital speedo and it has the smallest infotainment screen among this trio. Picture: Thomas Wielecki. There's ample room front and rear but the boot is smallest of this trio even though there is only a space-saver spare under the floor. On the road the Mazda's 2.0-litre revs more freely and cleanly than the other two cars, although all of them approach the limits of being able to haul a family of five and luggage up a steep hill. Around the city and suburbs where most spend their time, they're fine. 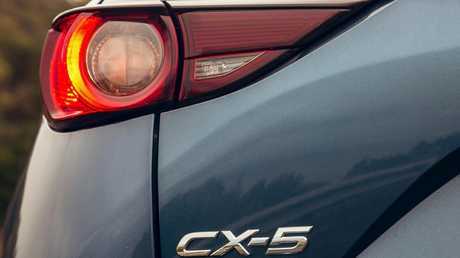 The CX-5 is alone in having stop-start engine tech, to eke as much out of each tank as possible. The Mazda's steering feels more natural and precise than the other two cars, and it's more sure-footed. We've previously criticised the grip of the Yokohama Geolander tyres but in this company they feel grippy, even on a winding wet coarse-chip road. 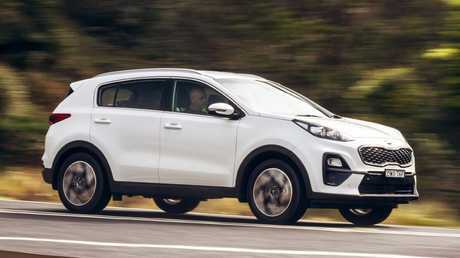 The Si Premium is the second model up in the Sportage range, available from $31,990 drive-away as a long-term deal - down from the full retail of $36,000. Standard fare includes autonomous emergency braking, lane-keeping assistance, rear camera with active guiding lines and front and rear sensors. Infotainment includes digital radio, navigation, Apple CarPlay/Android Auto matched to premium JBL audio. The Nexen tyres on the Kia Sportage had the least amount of grip in the wet among this trio but otherwise it is a decent drive. Picture: Thomas Wielecki. The recent update includes a higher resolution eight-inch touchscreen. The rear camera still has only average picture quality. There are two USB charging ports and three 12V sockets in the cabin - including, uniquely among this trio, one of each for rear passengers - but none in the cargo hold. Alone in this trio, there are rear air vents. The cabin has decent quality materials on the dash but that generosity doesn't extend to the doors, and there's a manual park brake lever versus electric park brakes in the other two. 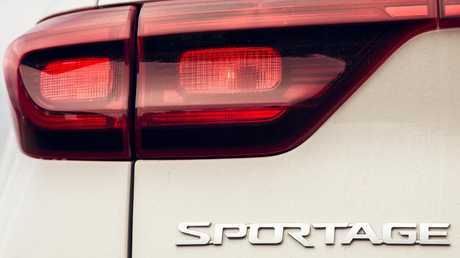 The Kia Sportage has soft-touch materials on the dash but not on the doors. 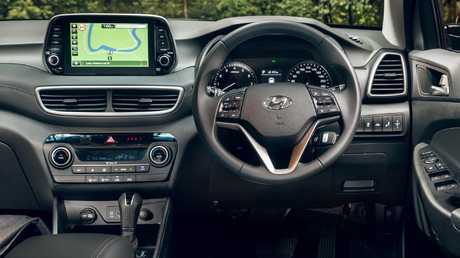 It shares the Hyundai’s 8-inch touchscreen and digital speedometer display. Picture: Thomas Wielecki. On the road the Kia copes well on lumpy tarmac and feels relaxed to drive. However, on wet roads the Nexen tyres conspicuously lack grip. It is the sketchiest of the trio around slippery corners. On these tyres, proceed with more than the usual level of caution, especially on damp roads. The Sportage would excel in this company with better rubber. Instead it shines with the longest warranty - seven years - and three-year running costs that are about one-third cheaper than the Mazda's. The Active X tested is the second model up in the Tucson range and available from $32,990 drive-away as a long-term deal - down from the RRP of $37,900. Despite the recent update it's the only one among this trio without autonomous emergency braking as standard - it's part of a $2200 option pack bundled with other safety technology, including radar cruise control, blind-zone warning, rear cross-traffic alert and lane-keeping assistance. 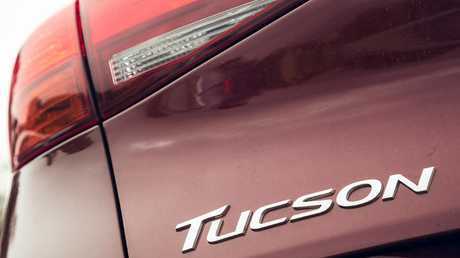 The Hyundai Tucson is a better drive than its Kia Sportage sibling but not quite as crisp as the Mazda CX-5. Picture: Thomas Wielecki. It comes with leather seats, electric park brake, dual zone aircon, folding side mirrors and an extendible sun visor, to block side glare in the late afternoon. 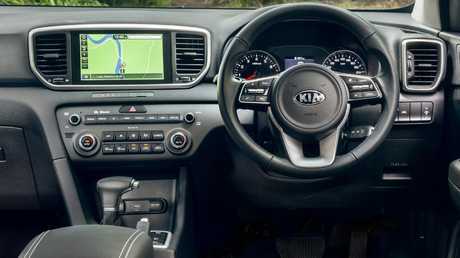 The infotainment shares the higher resolution eight-inch touchscreen with Apple CarPlay/Android Auto, digital radio and built-in navigation with related brand Kia, matched to premium Infinity audio. The rear camera lens image trails the quality of the display. There are two USB charging ports and 12V sockets in the cabin, including one USB point for rear passengers. The cargo hold gets 12V power. Dual zone aircon is standard but there are no rear vents. The new dashboard is a big step up from before and there are sections of soft-touch materials in the door panels. The Hyundai Tucson touchscreen pokes out of the dash like a tablet display. Picture: Thomas Wielecki. The cabins of all three cars tested are equally roomy, with good oddment storage. The Hyundai and Kia accommodate full-size spares in their cavernous cargo holds - and the Tucson has the biggest boot of this trio. 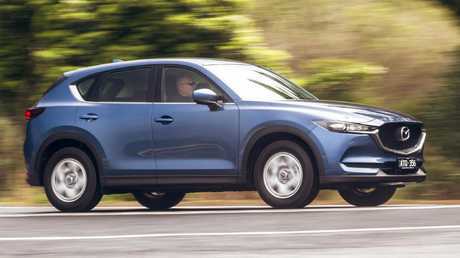 The Tucson's other key advantage: the lowest running cost over three years, about 10 per cent cheaper than its Kia cousin and a little over half the cost of the Mazda over the same period. On the road the Tucson is more middle-of-the-road in this test. The engine is happy to cruise and the suspension is comfortable over bumps. On slippery bends, the grip of the Kumho tyres is not as good as the Mazda. The Hyundai, too, would benefit from better rubber. 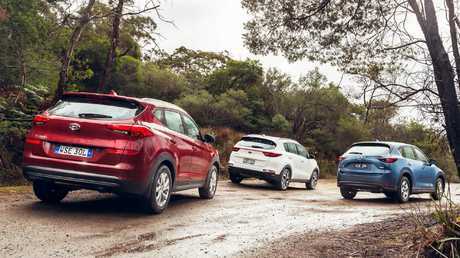 The Hyundai Tucson, Kia Sportage and Mazda CX-5, from left to right. Picture: Thomas Wielecki. This one is almost too close to call. 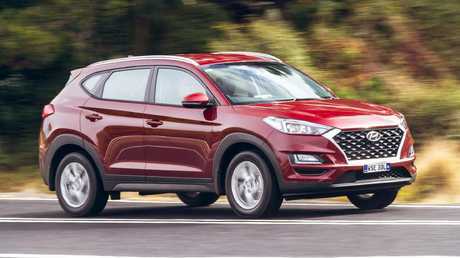 The Hyundai Tucson has a much-improved cabin and drives well but is edged out by the Mazda CX-5, which has more standard safety tech. The Kia Sportage interior may not be as sharp as the other two but it makes up for it with a cheaper starting price, more standard equipment, low running costs, and the longest warranty in the business.